Home › What’s the Anti Oxidant Method? What’s the Anti Oxidant Method? Anti Oxidant is defined as preventing rot and deterioration by oxidation. The Anti Oxidant Method slows the progression of rot and deterioration with the Anti Oxidant Solution. 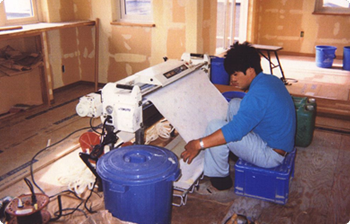 Special tools or techniques are not necessary for the Anti Oxidant Method and is a revolutionary building method as it actualizes healthy housing at a low cost. You may be suffering sick house building syndrome if you have psoriasis, pollinosis, asthma, eye irritation, headache, sleeplessness after moving into a newly built building, renovating your home, repainting the walls of your apartment or condominium, and termite control treatment. It is known that people who stay longer in the home such as children, housewives, and the elderly are at a higher risk for becoming ill from the home environment. If you experience any of these symptoms above, seek medical attention immediately! 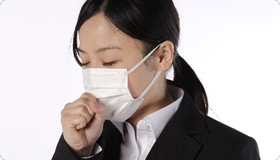 ■Currently, Sick Building Syndrome Control Act is restricting the amount of formaldehyde only. Over 200 kinds of other VOC (Volatile Organic Compounds) with indicated toxicity are not restricted. Many building materials continue to discharge formaldehyde even with the restriction of the act, even one rated the highest grade, F★★★★ (less than 5μg/m2h). The act doesn’t restrict the amount of materials used with the restricted levels of formaldehyde, therefore the materials still discharge a dangerous amount of formaldehyde. ■Newer houses have better insulation and are more airtight. Often, the materials used for construction are mass produced inexpensive adhesives and furniture in order to be cost effective. Chemical substances never stop discharging from them. Therefore, Sick Building Syndrome Controlling Act obligated construction companies to place a 24 hour ventilation system to new buildings. Discharging chemical substances out of buildings. Ventilating contaminates into the surrounding environment is almost the same as littering from your car or unlawful dumping of industrial wastes. ■We assert that most houses have a hidden risk of causing sick building syndrome. In consideration of Japanese housing circumstances (airtight and highly insulated), protecting ourselves from toxic chemical substances is nearly impossible. Houses should not have any toxic substances in order to be a healing space. We should prevent discharging of toxic chemical substances from houses to the environment by dissolving, rather than absorption. ■The Anti Oxidant Method with Anti Oxidant Solution solves all of those issues. The Anti Oxidant Method is an unique solution to restore the health of home residents, as well as acturalize purification of the earth’s environment. Once a house is built with the Anti Oxidant Method, you’ll realize amazing effects that not only countermeasure sick building syndrome but also eliminates odor and saves energy. As a countermeasure to sick building syndrome, toxic chemical substances (toluene, xylene and formaldehyde, etc) are dissolved and eliminated! Prevents condensation and mold, and deodorizes characteristic smells at nursing homes, hospitals, and etc! 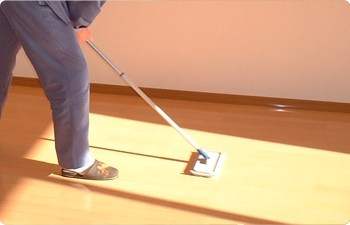 Prevents antistatic and house dust so that floor, wall and roof hardly get dirty! Cooler in the summer and warmer in the winter in the house. Saves energy about 30-50%! Controls pest and vermin so that termite, ticks, cockroaches, mosquitos, moths, flies and mice will not invade the home! Reduces maintenance costs by half (construction materials last twice as long). The effects last longer than typical absorbents because our products are not absorbents! Shorter construction work period and stronger foundation! There is no side effect as the Anti Oxidant Solution is not a chemical. The Anti Oxidant Solution can be used in paint, plaster, cloth, wax, and termite control treatment, and is applicable post-construction. It is available for both newly built buildings and for renovation at low cost. Mix 500ml (16oz.) of Anti Oxidant Solution per1m3 (35.31ft3) of ready mixed concrete, stir for 2 minutes, then install. 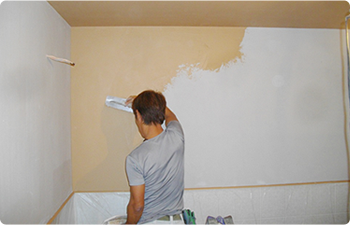 After drying, apply Iki-Iki Paint with a roller brush on the foundation and foundation wall. (Note) Iki-Iki Paint will dry in approximately 2 hours. Apply two coats of Iki-Iki Paint in kitchens and utility areas. 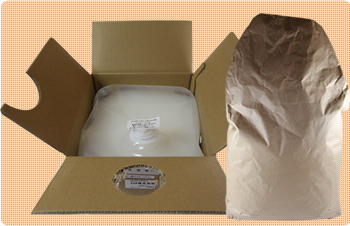 Make a solution with the ratio of 1 Anti Oxidant Solution: 3 Bio Ceramics purified water. 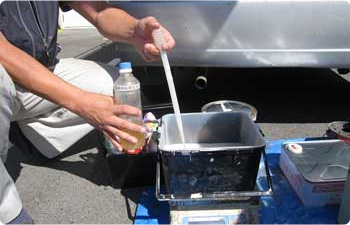 Use the mixed solution instead of regular water for making putty and glue. 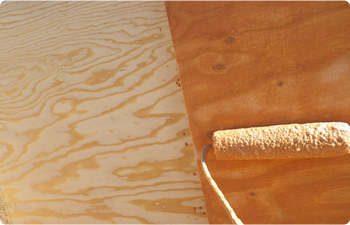 The putty and glue can be used in interior construction of the home. (Note) Use four Bio Ceramic sheets to make the Bio Ceramics purified water. Mix Anti Oxidant Solution at a rate of 5-10% for water based paints. For oil based paints, add 50ml (1.7oz) of Anti Oxidant Solution per 18liter (4.8gallon) and stir gently. Apply Iki-Iki Paint on the base floor under carpets. First, paint undercoat with Iki-Iki Paint. Second, make a solution the ratio of 1 Anti Oxidant Solution: 3 Bio Ceramics purified water and use it for mixing mortar, joint filling, etc instead of water. For cleaning, wipe with a mixed solution of ratio 1 Emina: 1,000 purified water. For waxing, apply Mugen Wax 3-4 times for newly built floors, and 1-2 times for floor maintenance. 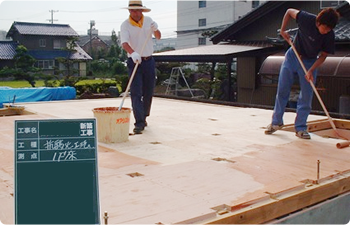 Apply Iki-Iki Paint with a roller on the foundation, walls, and roofs. The pre-fired diatomaceous earth (known to have a high absorption and desorption of moisture) and Anti Oxidant Solution (effectively eliminates free radicals) works together to effectively control termites, insulate, and prevent condensation and mold. For the best results, apply Iki-Iki Paint on as wide an area as possible against the volume. Iki-Iki Paint will dry in 2 hours. Apply Iki-Iki-Paint with a roller brush on the wood inside closets, drawers, and other furniture. The pre-fired diatomaceous earth (known to have a high absorption and desorption of moisture) and Anti Oxidant Solution (effectively eliminates free radicals) works together to effectively control termites, insulate, and prevent condensation and mold. Houses built with Anti Oxidant Construction Method do not need special tools and produces a maximum effect at low cost. This method can also be applied post construction. You may be suffering sick house building syndrome if you have psoriasis, pollinosis, asthma, eye irritation, headaches, and excessive sleeplessness after moving into a newly built building, renovating your home, repainting the walls of your apartment or condominium, and termite control treatment. It is known that people who stay longer in the home such as children, housewives, and the elderly are at a higher risk for becoming ill from the home environment. ● Iki-Iki- Paint is a necessary foundation for the Anti Oxidant Method! Along with the Anti Oxidant Solution, Iki-Iki Paint is an essential part of the Anti Oxidant Method. 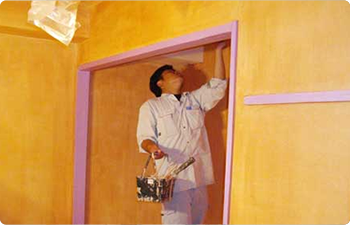 Iki-Iki Paint has baked diatomaceous earth and our Anti Oxidant Solution mixed in with the paint. The combined effects of the baked diatomaceous earth (high absorption and desorption of moisture) together with the Anti Oxidant Solution (eliminates free radicals) is excellent for termite and roach control, insulation, and control of condensation and mold. 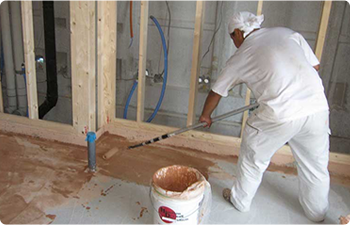 Iki-Iki Paint can be applied to building foundations, as well as under floors, closets, plywood, furniture, etc. Iki-Iki Paint is mixable with emulsion paint for toning as well. ●Spread the Anti Oxidant Method globally! Our Anti Oxidant Method can do what current scientific technology cannot do easily. For example, the Iki-Iki Bucket, a plastic bucket made with Anti Oxidant Solution, ferments kitchen refuse instead of letting the refuse spoil. Why does this happen? It is because the “bad” bacteria in the air stays away from the bucket and only good bacteria stays in the bucket; hence, kitchen refuse does not rot. Building houses and buildings with the Anti Oxidant Method will create the same condition on the earth as the one in the bucket. It may sound radical, but we expect taking advantage of this technology will prevent aging, reduce bad bacteria, and humans will become healthier. Air and water itself could become medicine. ● We can effectively utilize local air, water and soil for our health. Bio technology is actively developing more uses for naturally occurring beneficial bacteria. If we introduce bacteria generated in another region or county, however beneficial, the local bacterial balance may be disrupted. Local residents may become sick and have difficulty continuing to live there. The external bacteria causes disruption in the local bacterial balance, as well as the overall ecosystem. Making use of the local air, water and soil will provide a healthier life. We have been researching the Anti Oxidant Method as an ideal way to construct the ultimate environmental purification system. Although we are still continuing to research and ascertain its exact mechanism, you can try for yourself our various environmentally friendly products to experience the power of our Anti Oxidant Solution and Anti Oxidant Method.